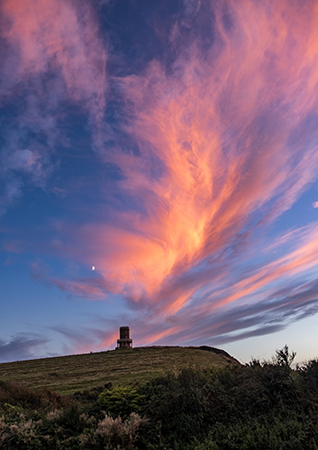 Clavel Tower backed by a New Moon and an angry sky overlooks Kimmeridge Bay. Dismantled,renovated and rebuilt a little distance back from the eroding cliff top, it now belongs to The Landmark Trust and used as a holiday retreat. I recently heard that there is a 2 year waiting time with it being in such demand.